Author(s): Zongwei Xu, State Key Laboratory of Precision Measuring Technology & Instruments, Centre of MicroNano Manufacturing Technology, Tianjin University, Tianjin 300072, China. Liyang Wang, Fengzhou Fang, Yongqi Fu, Zhen Yin. Background: In the past few decades, colloidal self-assembly method has been widely investigated and developed. This review will summarize several typical self-assembly routes, and introduce their recent progress, innovation and application. 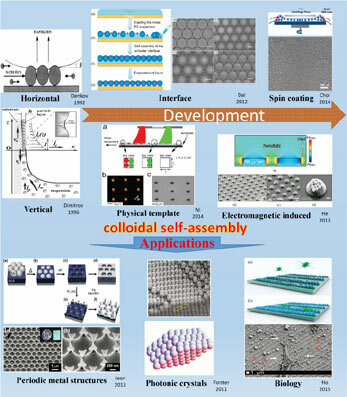 Methods: This review firstly presented the methodology and its developments for typical colloidal self-assembly methods. Then, typical applications of colloidal self-assembly methods in optics and biology fields were discussed. Results: 137 papers were included in the review. The colloidal particle size can range from tens of nanometers to a few microns to develop one-dimensional (1D) to three-dimensional (3D) superstructures. It can fabricate from simple single layer to multi-layer structures, and even more complex structures, like a variety of linear, circular and particles clusters with different shapes, etc. Secondary particles can also be realized through the self-assembly process with primary particles, such as polymer, inorganic or metal particles, even the inorganic and polymer composites. Meanwhile, due to the high accuracy and special properties of nanostructured materials or devices constructed with colloidal assembly, this review will also discuss their applications in fields of physics, chemistry, biology and so on. Conclusion: The findings of this review presented the importance of colloidal self-assembly methods and its applications for the fabrications of large area 3D micro/nanostructures, functional optical devices and biological devices, etc. With the research developments of colloidal self-assembly methods, this technique can give more and more contributions to nanotechnology, optics and biology. Keywords: Biological applications, colloidal self-assembly, micro/nanofabrication, photonic crystals. Affiliation:State Key Laboratory of Precision Measuring Technology & Instruments, Centre of MicroNano Manufacturing Technology, Tianjin University, Tianjin 300072, China. Keywords:Biological applications, colloidal self-assembly, micro/nanofabrication, photonic crystals. Abstract:Background: In the past few decades, colloidal self-assembly method has been widely investigated and developed. This review will summarize several typical self-assembly routes, and introduce their recent progress, innovation and application.